IPKON LLP elaborated a multi-step flexible unit for anchoring (see figure 1), allowing to achieve a self generated protective shell inside the tunnel of a mine. Every step forms an additional shell with a greater bearing capacity. Figure 1 – Flexible unit for anchoring installed in a mine tunnel. 1. an anchor (rod) made of reinforced steel; 2. the support plate with a hole in the center; 3. a tensioning nut; 4. a breakable shear tubes (green, yellow, red) placed at the end of the rod. A flexible unit is made of a few shear tubes. Such a configuration allows for the gradual increase of the resistance of the anchor ( the number of steps is equal to the number of installed shear tubes). This configuration of the anchor contributes to the formation of a protective shell inside the tunnel of a mine. 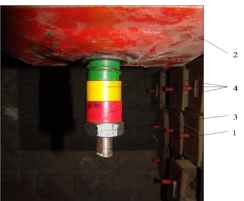 When displacement of the roof happens, the tension is transmitted to the anchor rod (1) installed in the borehole after going through the support plate (2), the tensioning nut (3) and the breakable shear tubes. If the of anchor experiences a load capacity greater than the strength of the material of the shear tube, it (the initial shear tube) only is deformed. This allows for the flexibility of the anchor to come into play and for the release of the stress occurring in the rock mass. Shear tubes have different resistance levels to compression and deform at different loads respectively. Shear tubes are installed in the order that allows an increase of the bearing capacity with every step of greater flexibility. Initially, the shear tube with the lowest resistance to compression is deformed. When the flexibilty of this shear tube is surpassed, the bearing capacity of the anchor increases to reach the value of the resistance of the next shear tube and so on. In this case, each step will generate a new shell with a greater load capacity.